it has been a very hectic week around here, which is why I haven’t had a chance to really post anything since a few days ago. I have been busy at work and with meetings at Sean’s school, Michelle was away on business and then came home, Sean has been busy at school and then sick and spring break is upon us with Easter right around the corner. It feels like we haven’t even had a chance to breather lately and the weather has been helping, with snow falling here on and off all day. Anyway,enough complaining about all of that stuff and let’s try to get down to some cooking! I had made this dessert last week as a nice Irish dessert that seemed perfect for right around St. Patrick’s Day and I got the recipe from The Complete Irish Pub Cookbook. 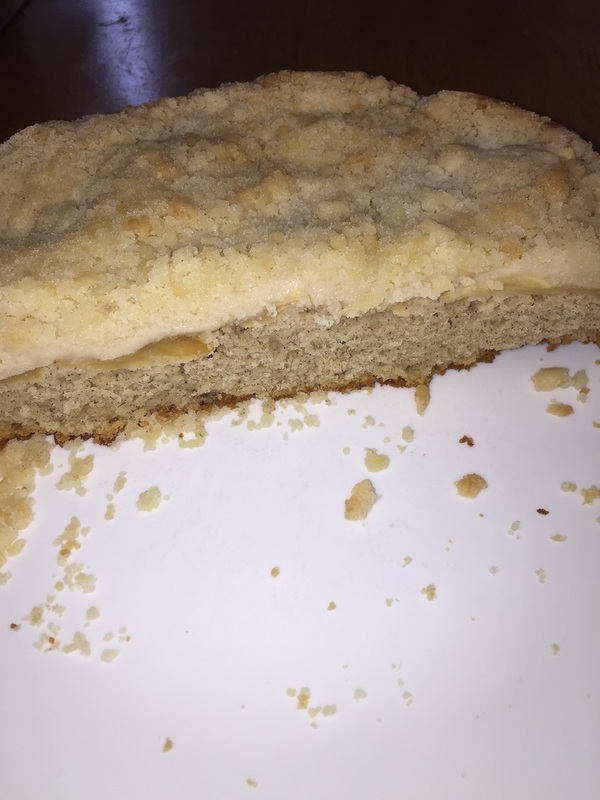 It is for an apple cake that makes use of just a few ingredients and it does not take any time at all to put it together. In about an hour you can have a nice dessert so it is a good one to keep in mind anytime you have a few apples around and you want a dessert in a hurry. Preheat the oven to 350 degrees. Grease a 9-inch round springform cake pan. To make the streusel topping, sift the flour into a medium bowl and rub in the butter with your fingers until the mixture resembles coarse crumbs or bread crumbs. Stir in the superfine sugar and set the topping aside. Peel, core and thinly slice the apples. To make the cake, sift the flour into a medium bowl with the baking powder, ground cinnamon and the salt. Place the butter and the superfine sugar in a separate large bowl and beat them together with an electric mixer until the mixture is light and fluffy, about 2 to 3 minutes. Gradually beat in the eggs, adding a little bit of the flour mixture with the last addition of egg. Gently fold in half of the remaining flour mixture, then fold the rest of the flour mixture in with the milk. Spoon the batter into the prepared springform pan and smooth the top of the batter. Cover the top with the sliced apples and then sprinkle the streusel topping evenly over the top of the apples. Bake the cake in the preheated oven for 1 hour or until the top is browned and firm to the touch. Let the cake cool in the pan before removing the sides of the springform pan. Dust the cake with confectioners’ sugar before serving. This cake tastes great when it is a little bit warm and you can serve it with some ice cream or fresh whipped cream on the side. It rose more than I thought it would at first as I was a little concerned as I put the batter in the pan that it seemed to dry, but it all came out nicely in the end and the cake was moist and flavorful. If you do not have superfine sugar you can make your own simply by processing granulated sugar in the food processor for about 1 minute. This is a nice dessert to make since it uses things you typically have around the house so you can throw it together if you need something last-minute for home or to bring to someone else’s home. That’s all I have for today. Check back next time for another recipe. Hopefully this week will be better than the last and I will have more time to get on here and share some recipes. Until then, enjoy the rest of your day and enjoy your meal! A Happy St. Patrick’s Day to you all! While for most people who think of Irish cooking as simply corned beef and cabbage and nothing more, I can tell you there are a lot of great Irish dishes you can try beyond that typical meal. There are some great meals you can choose from all over the Internet and I have posted a lot of Irish recipes on here, being he good Irish boy that I am. I have always wanted to see the cuisine beyond the corned beef and when Michelle and I went to Dublin we got to see, smell and taste a lot of different things. So if you are looking for some things to try this St. Patrick’s Day, here are some Irish meals I have posted on the blog that you can check out, including the classic corned beef and cabbage. There are also lots more great recipes out there on the Internet that you can check out from some great sources if you are looking for something a little different. I will be making the corned beef and cabbage in the pressure cooker, along with some Colcannon, cabbage and the brown bread. 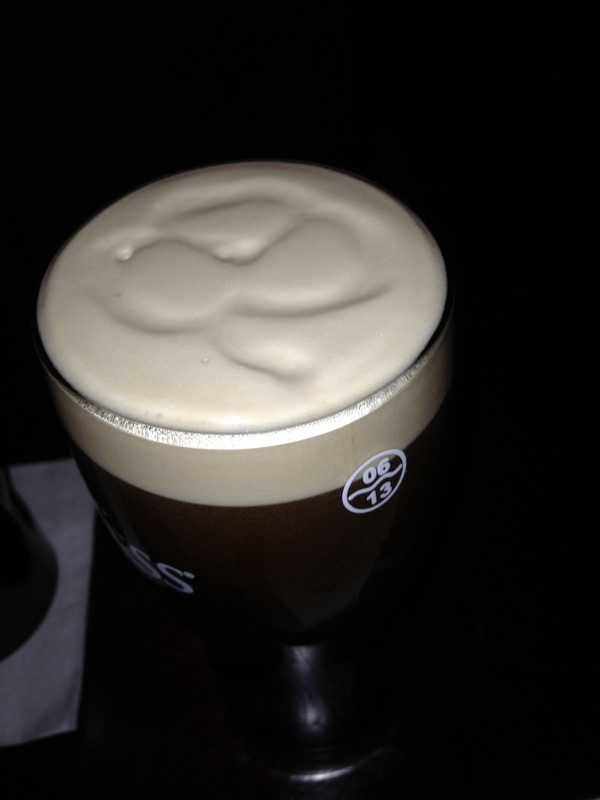 Of course there will be Guinness and Irish coffee later on as well. That’s all I have for today. Check back next time for some more great recipes. Until then enjoy the rest of your day, have a happy St. Patrick’s Day and enjoy your meal! Recipes for St. Patrick’s Day – Photo Gallery | SAVEUR. If you are looking for something else to make on St. Patrick’s Day besides your standard corned beef and Cabbage, Saveur Magazine has a number of great Irish recipes here that are perfect for you to give a try. Some are quite unique so check them out and see if there’s anything you want cook for yourself this year! I am working today but am hoping to get on later to share some recipes of my own. See you later!